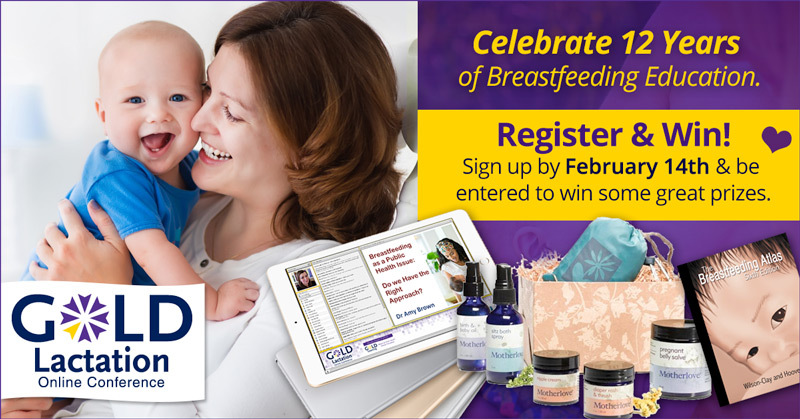 Celebrate with GOLD Lactation & WIN! As the GOLD Lactation Online Conference turns 12 years old, we're starting the festivities early by giving away a few fantastic prizes. Simply by registering for the conference by February 14 Extended until February 19!, you'll be automatically entered into our draw. You can also earn extra entries when you share this Facebook & Twitter post! Spread some love by leaving us a comment. We'd LOVE to know more about how you help breastfeeding families. Remember, all you have to do is register on/by February 19th to be entered into this draw. GOLD Lactation 2018 offers 27 hours of education from 32 amazing global Speakers. GOLD Lactation attracts over 2700 participants from 70 countries last year, making it the largest & signature event for professionals, students & volunteers working with breastfeeding mothers. Winners will be announced on shortly after February 19th. Earn extra entries when you share/retweet or comment on our social media posts!